I bet I know what you're thinking: "pickled WHAT with WHAT now??" Before you run away, give me a chance to explain! Please! These are not savory and garlicky like you might typically think of a traditional cucumber pickle. Yes, they're a fruit floating in vinegar-y liquid, but the similarities stop there. Cucumbers are fruits, right? They're sweet and cinnamon-y-- a friend compared the flavor to mulled wine-- with a nice tangy bite like a pickle should have. But they're not so strongly flavored that they overwhelm you with their pickled-ness. Great for snacking, and especially for tossing in a green salad or chicken salad. I'm pretty sure I'm watching my palate get more sophisticated by the minute as I try to convince the world that pickled grapes are normal and awesome. Hmmmm. What should I pickle next?! p.s. This recipe is from Molly Wizenberg's (of Orangette fame) wonderful, wonderful book. If you love food and you love stories, please read it. It will warm your heart. 1. Rinse and dry the grapes and pull them carefully from their stems. Using a small, sharp knife, trim away the "belly button" at the stem end of the grape, exposing a bit of the flesh inside. Put the grapes into a medium bowl and set aside. 2. In a medium saucepan, combine the remaining ingredients. Bring to a boil over medium-high heat, then pour the mixture over the grapes. Stir to combine. Set aside to cool to room temp. 3. 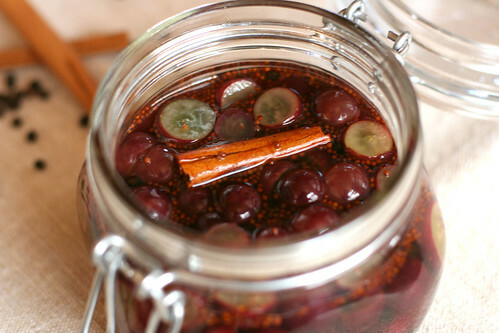 While the grapes cool, wash 2 pint-sized canning jars and their lids in warm, soapy water. When the grapes are cool, ladle them into the jars. Chill for at least 8 hrs or overnight. Serve cold, and use within 2 weeks. I've been intrigued by this recipe ever since I read it in Molly's book. And now I'm even more intrigued after reading your comparison to mulled wine! Yum! I bet this is really good! wow. never in one million years would i have used this particular combination, but if you think about it, it makes darn good sense. thanks for bringing this recipe to my attention, amy! WAW!! I am truly gobsmacked by this tasty dish! What a creativity!! I am going to make this!! This would also be great as a food gift! !